Intro: I don’t know whether or not Evernote can be considered Russian anymore, as it has become a global company with over $40 million in revenue (correction, only $18M, according to TechCrunch). But it has Russian origins founded by Russian American entrepreneur Stepan Pachikov. So I have decided to create a new section on GoalEurope called “Success Stories” which celebrates those rare gems which came out of Russia and Eastern Europe and have become global businesses. You probably know this very well, but I will give a brief introduction. Evernote, the personal productivity tool, helps organizing notes, photos, audio files etc by recording, tagging them and synchronizing across computers, Internet and mobile devices. 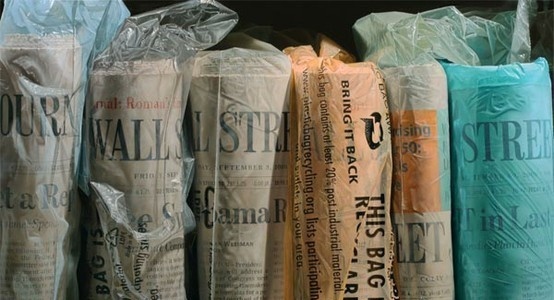 Offline access to the notes is a premium feature, and is highly beneficial here in Europe, where on frequent occasions during travels Internet connectivity may not be easily available. Evernote is used by 20 million users worldwide, 750 000 of them are paying customers. It also has a number of helpful applications such as Clipper, which helps clipping, tagging, storing and synchronizing web content and links, as well as Evernote Clearly, the tool which makes reading online content more easily, by concentrating on the text in a beautiful lay-out. 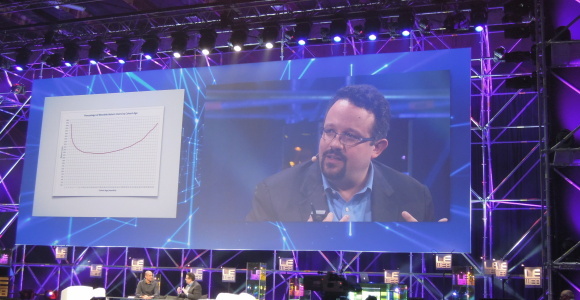 Today, Phil Libin, the CEO of Evernote spoke at the main stage of LeWeb and the first thing he announced was the big news: by Spring 2012 Orange customers will have access to Evernote Premium for free. This was followed by Libin introducing the graph showing the return visits to Evernote over time (see the image). The customers, who download Evernote the first time, eventually return to using it. To put it another way, once one begins to use Evernote, it is hard to stop. The convenience of tagging and accessing notes from any device is simply irresistible and helps being organized. Hence, once Orange customers get used to the always on access to the organized notes, after a year of premium access it will be hard for them to stop. Also at LeWeb Evernote has announced launch of two new applications: Evernote Food and Evernote Hello, which according to Libin has been a lot of news that came together at the last moment. Evernote Food is a mobile app which may be inspired by existing applications such as FoodSpotting, but according to Libin it is mainly for personal use (although one can also share food photos on social networks). The main idea behind it is to tag and memorize meals by not only what you ate but whom you had the meal with and pull together any other relevant information about the event. Evernote Hello helps memorizing people. Current functionality allows taking and tagging photos with a mobile app, currently available on iPhone (Android version is a work in progress). One can also link business cards of the people, as well as other related information. Adding LinkedIn profiles and other relevant social network information will be integrated in the future. And to conclude here is a big vision: the future Evernote will be more structured. 2012 will be the year of augmented intelligence, where the value of user data will be improved by adding context, information and intelligence, and maybe even using facial recognition to do that. Below is the interview with Phil Libin, conducted by Franco Solerio of Digitalia.fm. Will Pinterest loose the Russian market to Pinme.ru?